Sure, every room in your house needs a light switch. However, if you’ve got a gameroom, then you’re going to want something unique that “ties the room together.” The wonderfully geeky folks at Thinkgeek have brought us the perfect, yet simple, modification to illuminate our own geeky spaces. 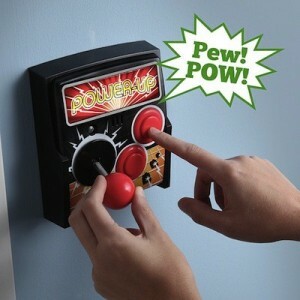 Instead of a regular on/off light switch, you now have the option of an arcade-style joystick to turn on your lights. Add a few cool buttons with sound and you’ve got yourself a perfect combination of functionality and flourish. With easy installation (see video below) and a reasonable price tag of less that $30, I think I know what I’m adding to my new gameroom. Pick it up at ThinkGeek today!